Mysuru: Hunsur has won the South Zone Award for Best City in Solid Waste Management (SWM) while the Heritage City of Mysuru has slipped into eighth position in the Swachh Survekshan 2018 from the fifth position it achieved in 2017. The rankings were released in New Delhi on June 25 by the Union Ministry of Housing and Urban Affairs. Hunsur has scored 280 out of 476 marks in the SWM indicators which include segregation of waste in a majority of Wards. Speaking to SOM, Parvathi Devi, the Swachh Survekshan Nodal Officer, who is also the Executive Officer of Hunsur City Municipal Council and Environment Engineer K.P. Ravikumar said that they have been practicing waste segregation since the last six years and waste that is collected from all the 27 Wards are efficiently segregated. For this, Pourakarmikas and members of Women’s Self Help Groups are involved and they play an active role here. Hunsur Municipal Council was established in 1925 and it stretches to an area of 10.36 kilometres and has 27 Wards with a population of 50,865. Every day, 21.86 tonnes of waste is generated. the Award from the dignitaries. CMC Environment Engineer K.P. Ravikumar (extreme right) is also seen. 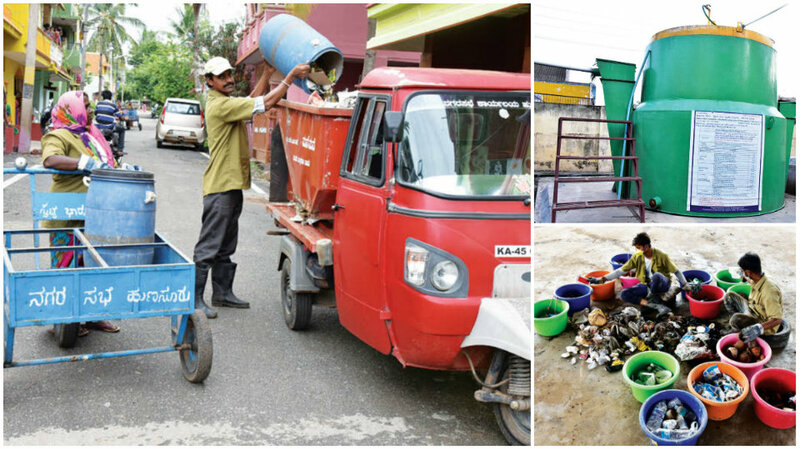 “We segregate waste at a majority of Wards and we have made several inroads towards efficient solid waste management like transporting the waste collected for processing on the same day, transforming the garbage vulnerable points, developing a landfill and processing a large amount of wet waste,” Ravikumar said. Women’s Self Help Groups and Pourakarmikas carry out door-to-door garbage collection by using 30 pushcarts. There are three zones for monitoring door-to-door collection where each zone contains nine Wards. There is one auto tipper for secondary transport. All the wet waste is being transported into auto tipper and dry waste are filled into polythene bags that are attached to each vehicle. “This is being transported to processing plant every day. In addition, we have set up a landfill site of about 4.5 acres and is situated 4.5 kilometres away from Hunsur. The waste is brought to the landfill site by auto tippers and tractor trailers. Wet waste will be re-segregated by workers within the plant. Once segregated, the waste is treated and compost is made,” Ravikumar explained. Mixed waste from road sweeping and drainage cleaning is dumped in heaps and turned periodically for aeration after 45 days. “Later, both the treated waste and the wet waste is screened by rotary screen and dumped into compost pits,” he said. Once compost is generated, it is sold to farmers at competitive rates. According to Ravikumar, many farmer-oriented programmes are held by the Hunsur CMC for compost sale. “Most of the bulk waste comes from hotels, restaurants, marriage halls, and meat stalls and waste collection is managed involving private parties through Public-Private-Partnership (PPP) Model. Food waste from hotels is fed to 100-kg capacity biomethanisation plant installed at the Government Girls Hostel. 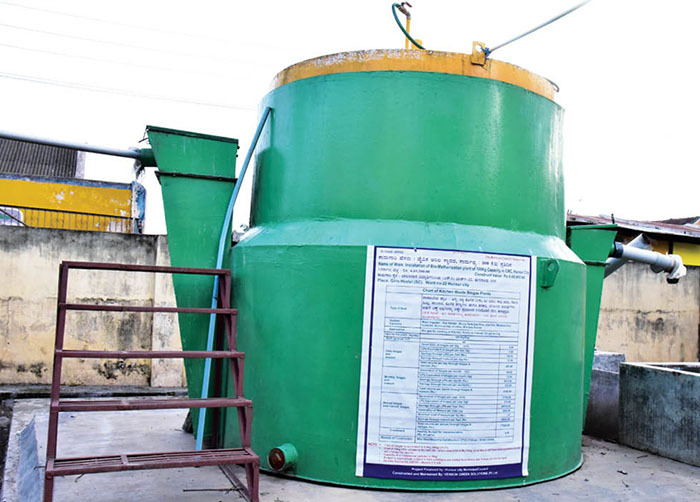 This plant generates cooking gas to the hostel,” Ravikumar said. This apart, Hunsur CMC conducts regular activities within the city to reach all the educational institutions, households and other stakeholders to meet Open Defecation Free target and better waste management in city. All garbage collection vehicles are being monitored through GPS to meet fuel efficiency and cost reduction. Commercial areas have twice-a-day sweeping facility, he added.